Moments after his court appearance, the Empire actor gave no other explanation for the attack, but said: 'I have been truthful and consistent on every single level since day one. I would not be my mother's son if I was capable of even one drop of what I have been accused of. An unwavering Smollett added: 'I would not bring my family, our lives or the movement through a fire like this. I just wouldn't. It didn't take long for Chicago's mayor and chief police officer to hit back at his claims of innocence. They slammed prosecutors' decision to drop all charges against him as a 'whitewash of justice' on Tuesday. Speaking at a press conference with the equally enraged Chicago Police Superintendent Eddie T. Johnson on Tuesday, Mayor Rahm Emanuel insisted repeatedly that Smollett was guilty of staging a hoax attack on January 29 and that he did it for a raise. 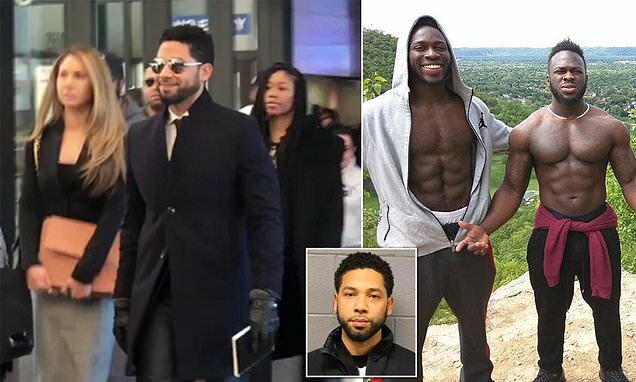 He slammed Assistant State's Attorney Joe Magats' decision to drop the 16 felony charges Smollett was hit with by a grand jury, a move he said he took because Smollett is not a 'violent threat' to the community. Magats' decision comes amid calls for his boss, Kim Foxx, to face investigation for exchanging text messages with Smollett's relatives in the early stages of the investigation.